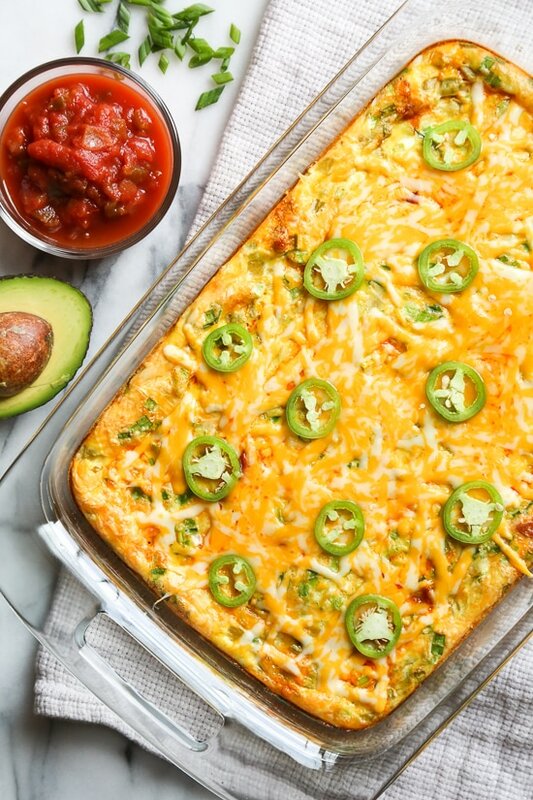 This easy Tex Mex breakfast casserole has all the makings of a delicious breakfast – potatoes, chorizo, green chilies and cheese. 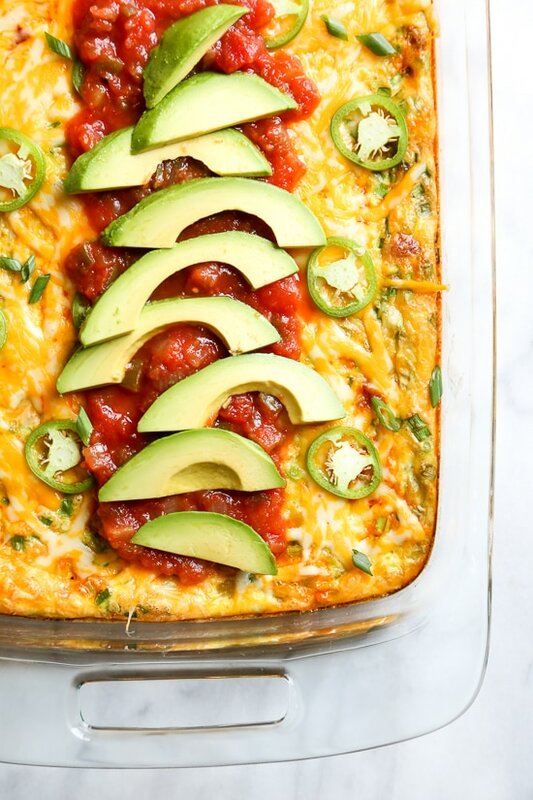 Topped with salsa and avocado, this is perfect to feed a crowd! The best part, there’s no pre-cooking! I used canned potatoes, although frozen would work, (of course, you can cook the potatoes if you prefer) and leftovers can be reheated throughout the week. 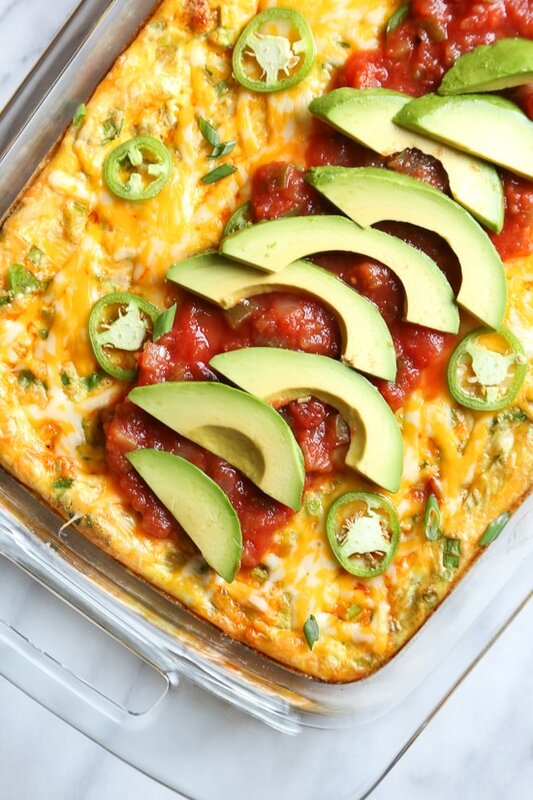 I am excited to partner with Pyrex to share this easy holiday morning breakfast dish, filled with everything I love with my eggs – potatoes, chorizo, green chilies, salsa, avocado and cheese (jalapeños are optional, but so good if you like a little heat). I already owned and love this Pyrex 8-piece glass mixing bowl set, but this Pyrex® Easy Grab Bake ‘N Store 8-pc Set has been on my wish list ever since my aunt got it. 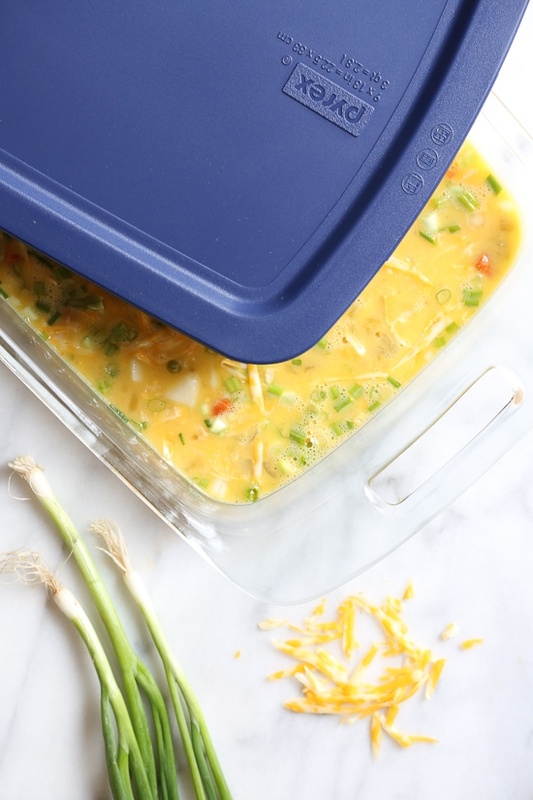 They’re not just pretty when serving, but also so convenient for make-ahead casseroles or potluck dishes thanks to their lids. I’ve used the large pieces for baking pasta and casserole dishes. 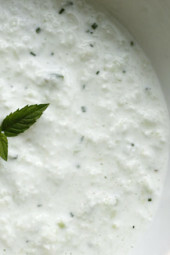 The small bowls are great for dips, cut up vegetables and leftovers. Save time on holiday mornings by prepping the night before and simply bake or reheat in the morning. To make this vegetarian, simply omit the chorizo or use soy chorizo. You can swap the chorizo for turkey kielbasa or turkey sausage. To make this low-carb, swap the potatoes for more vegetables, such as peppers, tomatoes or mushrooms. You can swap the cheese for cheddar or mozzarella. Spray a 3-qt (9” x 13”) oblong glass Pyrex baking dish with cooking spray. Place the potatoes in the baking dish. Top with chorizo, green chiles and 1 cup of the cheese. 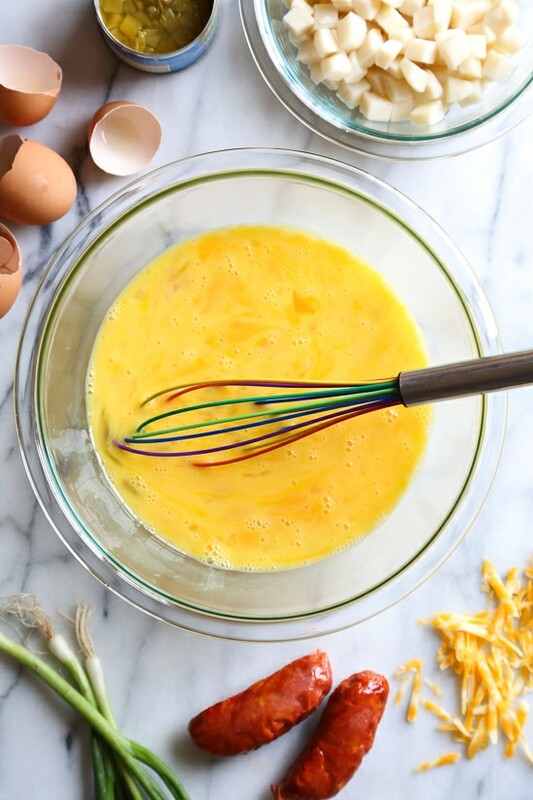 In medium bowl, beat eggs, scallions and seasoning salt with a whisk until well blended. Pour over potato mixture. Cover with lid and refrigerate overnight, if preparing the night before. When ready to bake, remove from the refrigerator and let it come to room temperature. Bake uncovered 55 to 60 minutes or until knife inserted near center comes out clean. 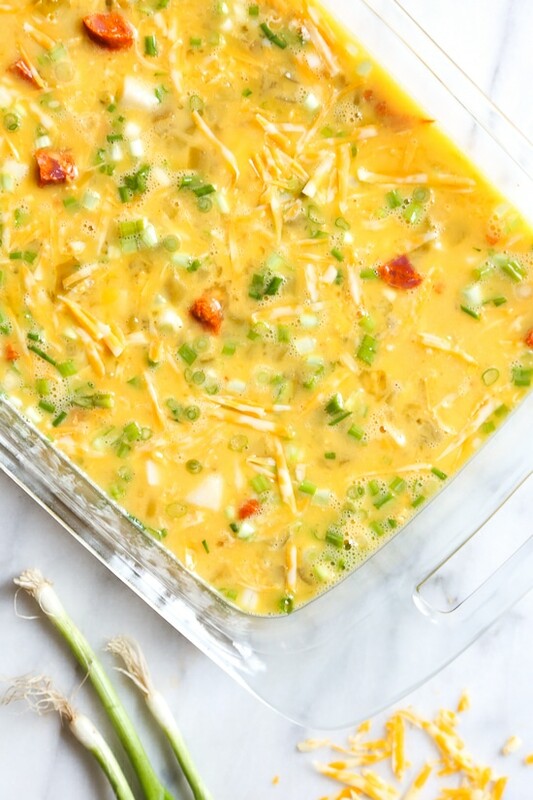 Remove from the oven, top with the remaining 1 cup of cheese and jalapeno slices. Bake 2 more minutes, until the cheese melts. 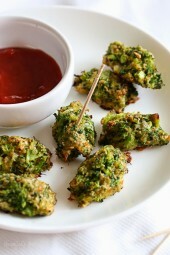 To serve, cut into 10 squares and serve with salsa and avocado. Where would I find Adobo Salt? I’ve never heard of it. Thanks! It is made by Goya and usually in with the spices. It can be found in the area of Hispanic foods/seasonings. Super tasty.I made this with a few alternations:- used 8oz of chorizo and cooked it in advance- cooked my own potato cubes the day before- made a box of Jiffy mix cornbread and put it in the bottom of the pan first- cooked for ~65 minI would totally make this again, with or without the cornbread bottom if I had some on hand. Do you have recommendations on how to reheat this? I’m planning to make it the night before and reheat in the morning. Can you estimate how to readjust the ingredients to cook in an 8×8 dish? 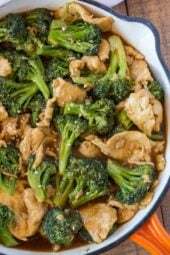 Love , love, love this recipe! Great for company. Freezes great individual pieces. Amazing Recipe. Thank you Gina!! Made this last night for dinner and it was delicious! The only thing I did differently was use turkey sausage instead of Chorizo. Yummy! Canned potatoes? Never heard of them. Sounds kind of weird. Recipe sounds good, but think I’ll cook my own spuds! I prepped this today and am so excited to eat it throughout the week! Curious about where the salsa comes in, though? Is it just a topping for the end? Thank you! It’s mentioned at the end of the recipe. It looks like you just use it for dipping. I love this! I tried so hard to love other egg bakes, because they’re so easy to make ahead for the week, but there always ends up being something about them that doesn’t quite work for me (I’ve tried so many different combos!). This casserole is THE ONE! It has all of my favourite things, and reheats SO well. This will be in heavy rotation for me! So simple and so delicious! Reheated well! I made this for Christmas breakfast. It was easy to make and delicious!! My entire family enjoyed it! Thanks Gina!! I will definitely make this again! This was so good! My family loved it! I never would have thought of using canned potatoes. Great time saver for a busy day. Thank you! Made this for Christmas morning since I assemble it the night before. It was delicious! The only thing I had to do differently was use Mexican chorizo. I cut it into little bites and it worked well! This was a hit with young and old! Another one of your recipes that’s a keeper! Thank you Gina!! ???? This delicious casserole was perfect for our Christmas morning. We substituted left over turkey breast for the chorizo. I want to make for Christmas brunch. I LOVE all of the recipes I’ve tried thus far. Am I wrong to think 3.5 Oz of chorizo is too light? I feel like it’s mostly eggs and needs more potatoes & meat. I haven’t made it yet, can anyone opine? This is pretty heavy with all the potatoes, the chorizo is just for flavor. SO excited to try this for Christmas brunch! Love your recipes! I just bought the Pyrex set! Thank you for your recommendations on cooking products. 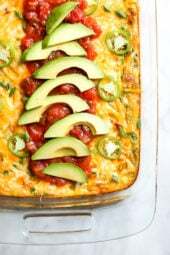 I plan to make this breakfast casserole over Christmas break. My family will love it! Wondering if this recipe would work in a crock pot? Could you use egg whites instead of whole eggs? If so, would I still need 12 or should it maybe be more? Sure, I freeze eggs often. Maybe a dumb question.. but do you freeze after you’ve baked it or do you freeze raw and then bake? If cooking the potatoes yourself, do you recommend boiling or baking? Do you recommend red or gold potatoes? Either will taste great. Red and gold will also both be delish. Perfect for my holiday brunch I am hosting this Sunday! Love the ease of it too! Can’t wait to make it. I can’t wait to try this. Can I use frozen tater tot’s instead of potatoes? What abut using frozen hashbrowns? Or would they make this watery? Don’t you mean 14.5 oz can of potatoes? Potatoes keep very well and long and have much beter taste than canned foods. I understanding people want shortcuts but they can think of that themselfs. I just get so sad thinking about all the modern conveniences that in fact just burden our earth with garbage and unneccesary use of petrol, energy and resources. The potato peelings can just submerge back into the envorment and fresh does not only taste better, it is better door you. As I mentioned, you can also use frozen or cook them yourself. With the Holidays in mind, I wanted something people can prepare the night before with a house full of company. Thank you for this recipe…and the shortcuts. This time of year can be difficult, and I love do ahead solutions! You are my go to for all entertaining, and you have yet to fail me! Thanks! i have the same question as Mary…what kind of chorizo did you use? Should that be a 14.5 oz can of potatoes? I couldn’t find one that small at the store. Hi Gina! I assume you are using Fresh Mexican chorizo and not Spanish dried? Thanks ???? Looks and sounds delicious! For some reason cooked chorizo is hard to find in my area. What could I use as a substitute? Would Mexican (uncooked chorizo) be a good swap, if I precooked it? Thanks! You could, or you could leave it out if you wish. Hey guys! I used the Spanish dried (Goya). I’m also wondering about any type of chicken chorizo, if there is any? I have never seen it, but I have seen soy chorizo. You can also you turkey keilbasa! Sprout’s Markets have a fresh Chicken Breakfast Chorizo. I’m sure you can find a recipe online but I actually purchased a bag for chorizo seasoning on Amazon. I buy ground lean chicken, season it and add diced green and red peppers and cook it. I use the crumbles to make a chicken chorizo breakfast burrito as a Mcdonald’s copycat. Taste great! I’m sure you can use the crumbled chorizo instead of diced in this recipe. Yes there is ! If you are in the Chicago land area Pete’s market has it . I’m sure local Mexican grocery stores will have it ! It’s delicious and not as greasy !